From the Moon: Mapping & Exploration explores how advances in technology and optics have been essential to our understanding of the Moon and its history. By investigating our relationship to the Moon through the lenses of science and technology, from Galileo's first observations to today's most advanced imaging techniques, we can begin to comprehend our age-old fascination through humankind's attempts to observe, and then describe, Earth's ancient companion. Down through history, each lunar map built upon all those that preceded it, as the cumulative layering of cultural and scientific knowledge helped bring the Moon into ever-sharper focus. Tracing the history of cartography and lunar exploration, a variety of maps and atlases of the Moon are displayed here in the Science Center and on the third floor of the Marlene and Nathan Addlestone Library (across the street). The development of optical technology is inextricably bound up with the progress of lunar mapping, since the descriptive skills of the mapmakers were always constrained by the instruments available. Serious observations of the Moon vastly predate the invention of the telescope. In 1000 BC, the Zhou dynasty built an observatory in today's Xian, China, and sites like Stonehenge provide even earlier examples. Only the development of glass lenses improved on human eyesight enough to study the Moon in any detail until the 1960s. With the assistance of rockets and improved camera lenses, lunar mapping and science advances benefited from robotic probes and the presence of human astronauts in lunar orbit, and later, the lunar surface. The invention of the telescope is generally attributed to German lensmaker Hans Lippershey, who announced his first instruments in 1608. But the improvements that Italian scientist Galileo Galilei made the following year were what really led to the first major leaps in understanding our sister sphere as a separate world. Galileo realized that the Moon has a rough terrain of mountains and craters, along with darker areas that he thought were seas (we now know they are ancient lava flows). Sketches and watercolors by Galileo and other astronomers soon made it possible for early lunar cartographers like Johann Hevelius, Tobias Mayer, and Johann Heinrich Lambert to begin making increasingly accurate maps—a process that continues to this day. By now the topography and mineralogy of much of the lunar surface has been charted. Yet many mysteries remain to be solved. For most of the last century the Moon was thought to be geologically "dead": an inert orb of arid stone disturbed only on the rarest of occasions when accidentally impacted by a rogue asteroid. But in 2009 water was discovered in its polar regions by the Moon Mineralogy Mapper high-resolution spectrometer and confirmed by imaging spectrometers on board the Deep Impact and Galileo missions. After the telescope, the photographic camera was the second great optical invention that advanced our understanding of the Moon. Before practical photography was achieved (in 1839), astronomers could only sketch what they could see through the long barrels of their instruments. In time, Earth-based photographs would offer a relatively easy way to produce highly accurate, detailed images of the Moon's surface that could be studied at leisure, as opposed to constantly readjusting big telescopes to compensate for the speedy rotation of the Earth while trying to record the view with a pencil. The Earth-based photos also make it possible to record multiple images that often reveal changes over time, and even to create three-dimensional stereo views. But in order to do that, still more powerful lenses and faster emulsions were needed. Even as late as 1885, wet plate photography was still so slow that James Nasmyth and his partner James Carpenter were forced to build plaster models of the lunar surface, and then photograph the models under harsh, raking light to simulate photographic illustrations for their book, The Moon: Considered as a Planet, a World, and a Satellite. Less than a decade later, however, the technology of lenses and emulsions had finally advanced enough that Earth-based lunar photography quickly reached a zenith in the work of Maurice Loewy and Pierre Puiseux. Their great opus, L'Atlas photographique de la Lune (1894-1910), is still considered one of the crowning achievements of late 19th-century science, while their photos are still considered among the most beautiful images of the Moon ever made. The next great development in space exploration was spawned by Nazi German scientists who sent heavy explosive warheads mounted on guided V2 rockets across the Channel to attack England. In the Cold War aftermath of World War II, the Soviet Union and the United States continued the "Space Race" by building increasingly powerful Intercontinental Ballistic Missiles (ICBM's) in an effort to dominate the new frontier that lay beyond the atmosphere. The competition entered its most keenly competitive period in October 1957, after the Soviet Union launched a basketball-sized satellite named Sputnik. Within months, the National Aeronautics and Space Agency (NASA) was formed and immediately began initiating a series of major scientific and military projects. Then, in the summer of 1962, President John F. Kennedy set a new, ostensibly more peaceful goal for the space program during a famous speech at Rice University, when he challenged the nation to put a man on the Moon before the end of the decade. Seven years later, on July 20, 1969, NASA and the Apollo 11 astronauts—Neil Armstrong, Michael Collins, and Edwin "Buzz" Aldrin Jr.—realized Kennedy's dream when Armstrong made the first human footprint in the powdery gray dust of the Sea of Tranquility. Since that time, NASA and its global partners have continued exploring space while dramatically increasing our knowledge not only of the Moon, but also of the origins and evolution of the Earth and the rest of the Solar System. By the end of the Apollo era, computers were becoming more important to lunar and planetary observations and mapping. By the mid-1980's digital photography had by and large replaced film. Orbital and fly-by missions, such as Galileo and Clementine carried digital cameras with filters such that we could explore the Moon at different wavelengths. More recent missions such as Kaguya (Japan), Changé (China), Smart -1 (Europe), Chandrayaan-1 (India), and Lunar Reconnaissance Orbiter (USA) all included digital cameras capable of viewing the Moon in multiple wavelengths. Spectacular results from these missions are shown herein. From the Moon: Mapping & Exploration takes measure of this human quest for knowledge. 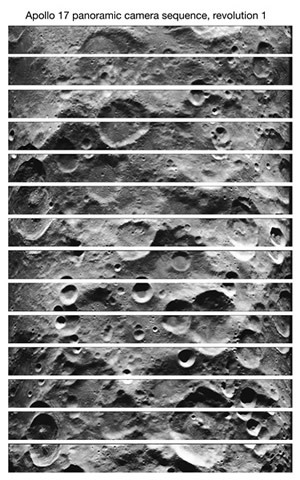 Beginning with historical maps and atlases, and, moving clockwise, ending with Google Moon and imagery from the Lunar Reconnaissance Orbiter Camera (LROC), the objects and images in this exhibition provide a small cross-sectional view of this epic journey. Every effort has been made to demonstrate the international nature of this scientific endeavor by providing information about the space programs and research initiatives of our international colleagues. The Moon Rock on display is from the Apollo 15 mission (July 26 – August 7, 1971), collected near a sinuous rille, or volcanic lava channel called the Hadley Rille. 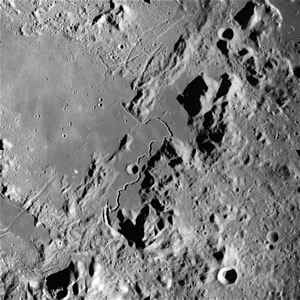 We chose this particular mission as a point from which to demonstrate the variety of mapping and photographic techniques used in the planning, execution, and analysis of the Moon. This exhibition will be followed in 2013 by a companion project that examines humankind's complex relationship to the Moon through the lens of the arts and humanities: From the Moon: Myth & Mystery. Co-curators of From the Moon: Mapping & Exploration Organized by the Halsey Institute of Contemporary Art and the Geology Department, School of Sciences and Mathematics at the College of Charleston. Produced by the Halsey Institute of Contemporary Art and the Geology Department of the College of Charleston, and by the Northeast Planetary Data Center at Brown University. Co-curated by Mark Sloan, Director of the The Halsey Institute of Contemporary Art at the College of Charleston, and Roger Manley, Director of the Gregg Museum of Art & Design at North Carolina State University, with Lunar Science Consultant Dr. Cassandra Runyon, Professor of Planetary Geology at the College of Charleston. Production assistance and digital imaging provided by Peter Neivert, Manager of the Northeast Planetary Data Center at Brown University, Providence, Rhode Island. We gratefully acknowledge funding and support for this effort by NASA, Moon Mineralogy Mapper, and the NASA Lunar Science Institute, and the partnership of the Lunar Planetary Institute, Houston, Texas, the School of the Arts, Marlene and Nathan Addlestone Library, and School of Science and Mathematics at the College of Charleston.